ScanGuard Security Suite - also known as ScanGuard Antivirus - provides a large variety of security suite features that would be hard to match. 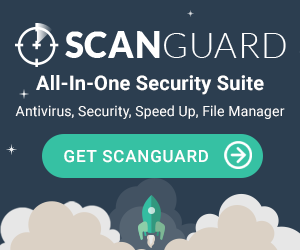 As a relatively new company, ScanGuard is really trying to stand out with ScanGuard Security Suite, competing with other, more established security mega-suites with multi-device coverage at an affordable price. ScanGuard Security Suite provides a wide range of security features, from an advanced firewall to real-time protection and a malware quarantine option that protects your computer from potentially suspicious programs while giving you the option of what to do with them. When paired with a relatively intuitive user interface and 24/7 technical support, ScanGuard Security Suite really has leaped into the field with both feet, fighting to be recognized amongst the crowd of security mega-suites that are already available. While the introductory price is very affordable, ScanGuard Security Suite’s renewal cost can be a bit pricy, costing as much as some of the other, more recognizable security suites available today. A lack of independent testing results or major reviews makes it hard to truly assess how well ScanGuard Security Suite stands up to its competitors. ScanGuard Security Suite also makes you sign up for an account on their website before you’re allowed to download a free trial, which may make some users suspicious. ScanGuard Security Suite doesn’t have any test results from independent labs, as it’s a fairly new product on the market. However, our hands-on tests have shown that it does do a solid job of guarding against malware and removing viruses from your system. ScanGuard Security Suite’s introductory price is very affordable; for $59.95 you get a full fleet of security options and protection for up to 5 cross-platform devices. However, the full price of $149.95 is comparable to some of the other security suites we’ve reviewed, which may offer coverage for more devices or have verifiable test results from independent labs. ScanGuard Security Suite does offer a free trial, and has a money-back guarantee if you’re not satisfied with the product. This may be where ScanGuard Security Suite truly shines. In an effort to compete in a saturated playing field, ScanGuard Security Suite offers a truly huge selection of features, including a quarantine, real-time malware protection, a start-up guard, an advanced firewall, PC tuneup options for streamlining your system’s performance, and more. Aside from the frustration of having to make an account before you can buy (or download) anything on the ScanGuard website, ScanGuard Security Suite’s installation process is fairly straightforward and easy to use. It’s accessible to people without a lot of technical knowledge, and the user interface lets you easily run scans, check your device’s status, and more without needing to be a computer genius. One of the things that ScanGuard offers that not every security company provides is access to 24/7 live chat on their website. While they do also offer email support, the live chat feature is probably going to be the most useful to the most customers, as problems can arise at any time of day or night. Being able to reach a ScanGuard technician whenever you need them is a nice perk of the software. ScanGuard also provides a searchable knowledge base with tabs for mobile and desktop tutorials, general FAQ’s, account and billing help, and more. Their support features are robust and allow customers to get help when needed, though ScanGuard may want to consider a forum in the future, when they have a few more users. Unfortunately, ScanGuard doesn’t offer any sort of “About us” tab on their website, so we weren’t able to learn a lot about the company itself. Therefore, we can’t provide you any information about ScanGuard’s company history. We’ve reached out to them to get you more details and will update this page as soon as we hear back. If you’re willing to work with a new company that doesn’t have a lot of independent testing data, ScanGuard Security Suite may be a good option for you. The variety of security components, relatively affordable introductory price, and accessible customer support make ScanGuard a good candidate for a company that may be able to compete with the big guns. If, however, you’re looking for something that’s got a little more history, there are plenty of security suites with similar features that have been independently tested - you can check out their reviews on our website.